My motto for December is 'Feel the Twinkle'! 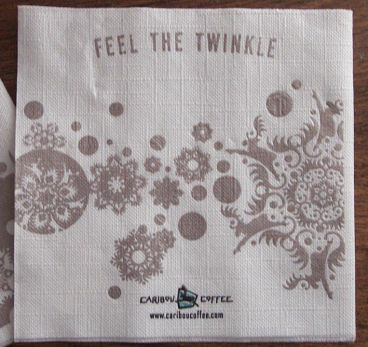 I found these napkins at Caribou Coffee and they just sum up the whole month for me. What could be BETTER than to 'Feel the Twinkle' each and every day? If you start to feel tired, over loaded, or oh my... stressed!! Get out this napkin and repeat it's saying five times... let me know if it works! I might have to make a banner with this... I love it! It's companion napkin says 'Ride the Yultide'.. so clever! Check out their website... cute graphics for December.